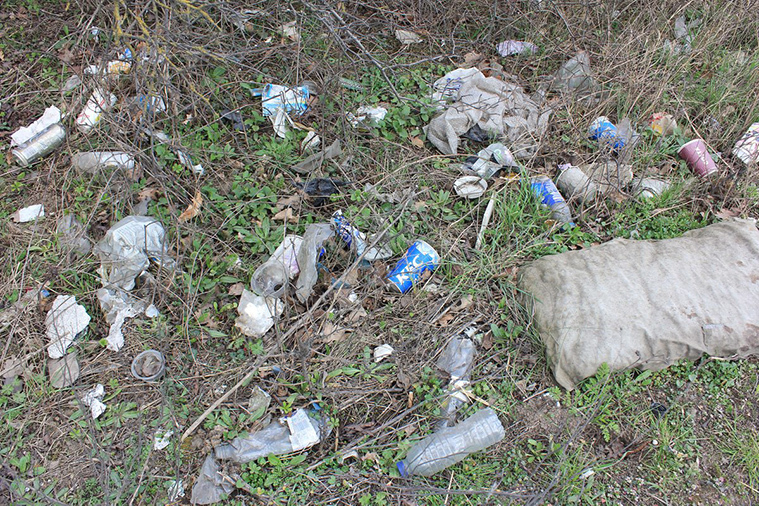 In 2015 a Commons Select Committee concluded that that “England is a litter-ridden country compared to most of Europe, North America and Japan”. There’s been a lot of news around the pollution caused by plastic waste in the environment. You don’t have to go far to see this. The A47 to the west of Eye along the southern edge Star Pit Nature Reserve is one of the cities grot spots. The nature reserve is a site of special scientific interest with many species of water beetle found in the shallow pools. Cans, coffee cups and plastic bottles seem to make up a lot of the litter but there is also a wide range of packing, plastic bags, drinks cartons and miscellaneous pieces of cardboard. Some of it is quite old so it obviously hasn’t been cleaned for a while. If this was along Bourges Boulevard in Peterborough there would be an outcry because this is in the ‘countryside’ it almost seems fine to ignore it. Research on roadside litter by the RSPB and Keep Britain Tidy has found more than 8% of bottles and almost 5% of the cans contained remains of some of our rarest native mammals, including shrews, bank voles and wood mice. 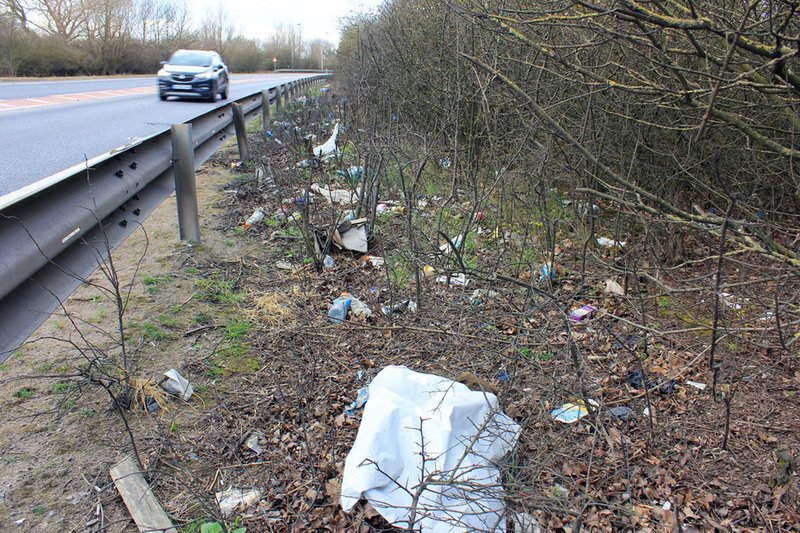 “Thank you for your email to the Highways England Customer Contact Centre dated 21 April regarding litter on the A47. Highways England is responsible for the maintenance and stewardship of motorways and trunk roads in England. However, the responsibility for litter collection on trunk roads falls under the local authority. Under the provisions of the Environmental Protection Act 1990: Code of Practice on Litter and Refuse, responsibility for keeping all-purpose trunk roads (APTR) free from litter falls to the local district and borough councils. There are a few lengths of trunk road on which Highways England is responsible for litter collection and these are detailed in the attached extract from the Network Maintenance Manual. 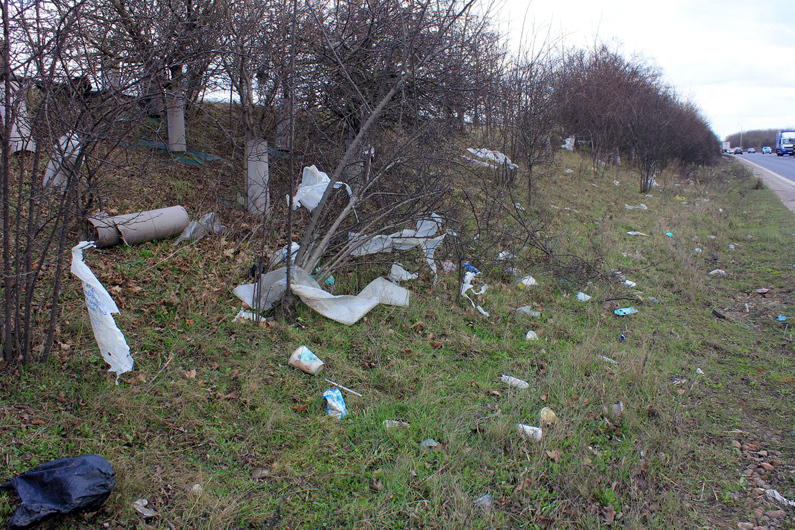 Highways England regularly monitors the cleanliness of its network, and where it considers that the standards set by the Environment Protection Act are not being met, writes to the relevant local authority asking for swift action to be taken to cleanse the area of accumulated rubbish. On safety grounds, any material that is a hazard to traffic (i.e. debris in live lanes) is removed directly by the Police or Highways England as a matter of priority. Based on the information you have provided, the road you refer to is managed by Peterborough County Council. May I, therefore, suggest you redirect your query onto them. We hope that by working with these district and borough councils we will be able to help resolve the issue of litter on the trunk road network. We also urge drivers to keep their rubbish with them and dispose of it safely and sensibly upon reaching their destination. Thank you once again for contacting Highways England Customer Contact Centre. I hope that this helps with your enquiry. If you have any further questions regarding this or any other Highways England issue please visit our website where information on all Highways England policies and procedures can be found: http://www.highways.gov.uk. Alternatively please email us at info@highwaysengland.co.uk or you can contact us at our 24-hour Customer Contact Centre on 0300 123 5000. Of course it’s not the fault of Highways England or the City Council that the rubbish appears there in the first place. Its a sad reflection on today’s society that so many still think nothing of throwing litter from their vehicle window. With budgets being squeezed the cleaning cycle gets further and further apart and the result is litter strewn verges. How you educate people that this isn’t acceptable still remains to be answered. Its not just Eye that has this problem. See the video below from the A40 in Buckinghamshire. And cleaning litter from the side of busy roads isn’t without its difficulties and can be a dangerous operation. It can be expensive to close a lane and cause huge disruption to drivers. From April this year, the maximum on-the-spot fine local authorities can issue for dropping litter nearly doubled from £80 to £150. And for the first time, local authorities can also use these littering penalties against vehicle owners if it can be proved litter was thrown from their car. In a town centre it’s reasonably easy to catch people littering but on a fast-moving road, it’s much more difficult. Will higher fines make any difference or is education the answer? Does anyone remember the Keep Britain Today campaigns from the 70s/80s? Can we put a price on the environment? It seems we can and as summer heads our way the litter will again be hidden among the long grass and shrubs but it will still be there. Please take litter home and bin it. If you want to read more the Clean Highways website is a treasure trove of information.